Samajwadi Party chief Akhilesh Yadav will contest from Azamgarh in Uttar Pradesh in this year’s Lok Sabha polls. This ended all speculations surrounding Akhilesh’s possible choice of seats for the parliamentary polls. Many had speculated that Akhilesh may choose Kannauj, from where his wife Dimple Yadav had won in 2014. The SP chief’s father Mulayam Singh Yadav had won from Azamgarh five years ago. With Akhilesh choosing Azamgarh for himself, Mulayam will contest from his family bastion Mainpuri. This also means that Dimple will now be seeking another term from Kannauj. Kannauj was represented by Akhilesh until 2012, when he vacated the seat to become the chief minister. Dimple later won the seat in the bypolls. Azamgarh is believed to be a safe seat given the sizeable population of Muslims and Yadavs. Even during the so-called Modi wave in 2014, the SP had won this seat by over 60,000 votes. 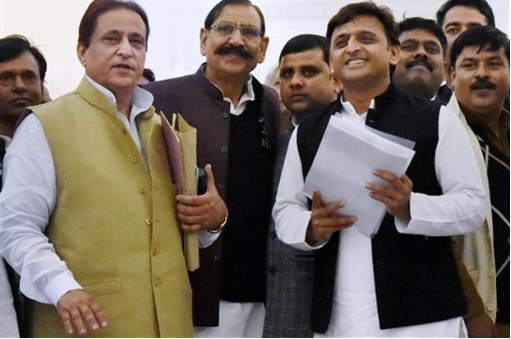 In another big announcement, the SP said that its former state minister Azam Khan will contest from his home town of Rampur. Khan is currently a sitting MLA from here. The party also released the list of its star campaigners that included the party chief Akhilesh Yadav, his uncle Ram Gopal Yadav, Azam Khan, Jaya Bachchan, Dimple Yadav and Tej Pratap Yadav among others. Uttar Pradesh will go to polls in seven stages with the counting scheduled for 23 May.